If you’re as untidy as we are, you probably have nondescript little cobwebs on the ceiling, especially in the corners. These nondescript cobwebs are made by a nondescript spider called the sac spider. It’s not clear what family they belong to: Miturgidae or Clubionidae? I believe the modern classification is in Miturgidae. I don’t know what the actual species is, but the New World is supposed to have only two species, Cheiracanthium inclusum and C. mildei. They’re not as gentle as they look! Their venom is reputed to be necrotizing: in other words, it kills flesh. This can lead to pretty awful secondary infections, and recovery is slow. This is a little disconcerting for a spider that likes to hang out on toilet seats late at night. 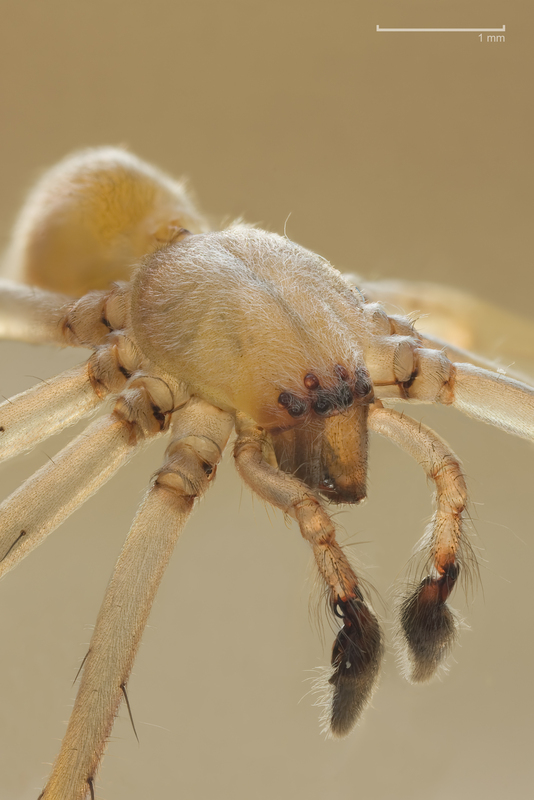 On the other hand, there are people who claim that actual reports of necrotizing bites by sac spiders are practically non-existent. So no need to worry, right? Sac spiders are a bit of a mystery to me. 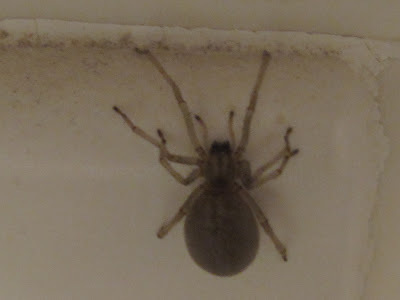 They are nocturnal predators, like wolf spiders. Except: I’ve never seen them move particularly fast, and their eyes are not particularly large, as you can see in the photos. What do they eat? How do they sense their prey? How do they catch it? Another aspect I’d like to understand better is their behaviour. I think that I see the same spiders in the same spaces night after night. Are they territorial? Both males and females? Can male and female ranges overlap? How big are the ranges? 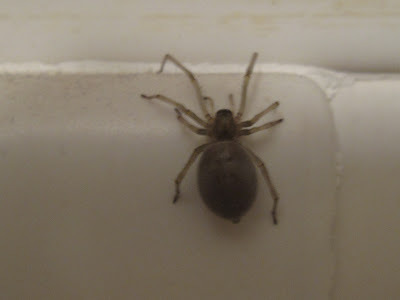 Is there a good way to tag a spider so you can recognize it again later? So much to learn — which is a good thing. And a link to photos on bugguide.net with the eye pattern.